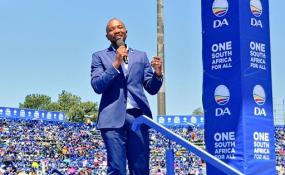 Mmusi Maimane at the #DAmanifesto launch at Rand Stadium. "The DA is of the view that Magashule's stunt is tantamount to vote buying and an infringement of clause 9 (2) (a) (iii) of Schedule 2 of the Electoral Act. The IEC's Code of Conduct explicitly prohibits the use of a financial inducement to gain a vote for a political party," the party's Mike Moriarty said in a statement on Sunday. Magashule has recently been making news headlines following the publication of the book, Gangster State: Unravelling Ace Magashule's Web of Capture , by investigative journalist Pieter-Louis Myburgh. The book reveals details of Magashule's alleged iron fist rule while premier of the Free State, and his hand in the state capture project, which Magashule has denied.